A collaboration between Lakewood coffee shops has brewed up a unique community celebration centered around coffee and art. The Lakewood Coffee Shop Hop takes place Sunday, April 15, from 2 to 5 p.m. at seven participating coffee shops. This free-to-attend event will showcase student artwork with the launch of a contest-winning ink drawing turned coffee cup design by Lakewood High School senior Micah Inak. Each shop will offer their products in this cup, while also displaying artwork created by students from the Lakewood City Schools. 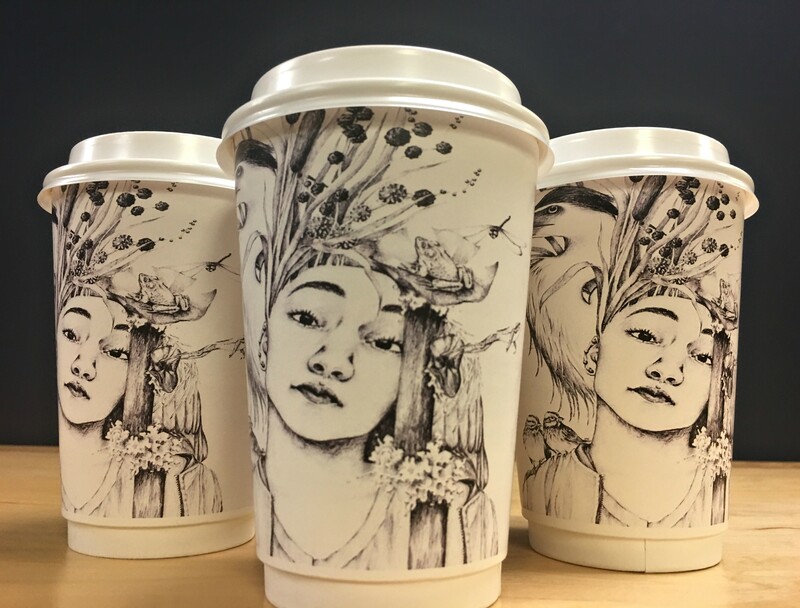 The Lakewood Coffee Shop Hop will showcase Micah Inak’s contest-winning ink drawing turned coffee cup design. The festivities kick off with a brief reception at 2 p.m. at The Root Café to honor Micah, whose ink drawing was selected as a winner during the Ninth Congressional District Invitational Art Competition orchestrated by U.S. Rep. Marcy Kaptur. The ink drawing was then adapted to a coffee cup design as a collaboration between local businesses and the art community. Following this reception, guests are encouraged to visit each coffee shop in any order they choose to view students’ artwork and have their “Coffee Passport” (Micah’s coffee cup) stamped at each location to be eligible for a gift card drawing. Rep. Kaptur – who recently became the longest-serving woman in the history of the U.S. House of Representatives – will make an appearance during the Lakewood Coffee Shop Hop. The student artwork will remain on display at each coffee shop for at least one week following April 15. A portion of the proceeds from each shop’s coffee cup sales during the Lakewood Coffee Shop Hop will be donated in support of the arts program at the Lakewood City Schools. Guests who visit at least four participating coffee shops starting April 15 and submit their Coffee Passport to The Root Café by noon on Friday, April 20, will be entered into a drawing to win gift cards from participating cafes. The drawing will take place at 5 p.m. on April 20 at The Root Café and contestants need not be present to win. For more information regarding the Lakewood Coffee Shop Hop, please visit the Facebook event.